Review: It has been eight years and there is now a new terrorist leader. The city is in trouble and the Dark Knight comes back. Really enjoyed this film! The only problem for me was that I did find it a bit too long and they could have cut out several scenes. This film contains some moderate fantasy violence. Christopher Nolan expressed distaste for shooting the film in 3D. 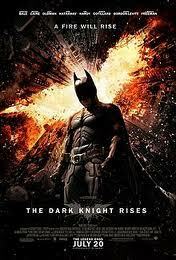 This is the fifth film in a row that Christopher Nolan has worked with Michael Caine. The first Batman movie is 140 minutes long and then the middle film is 152 minutes, this one is 164 minutes, They are 12 minutes longer than the previous ones.